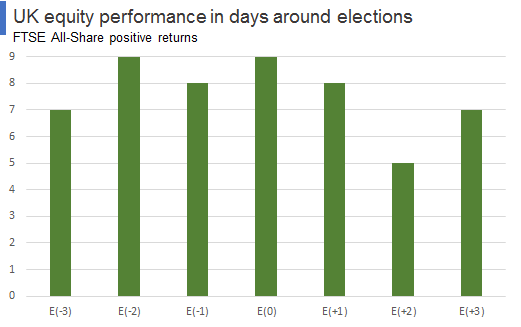 The following chart plots the number of times the FTSE All-Share Index has had positive returns in the 7 days around UK parliamentary elections since 1970. For example, in the 12 elections there have been since 1970 the Index has risen 7 times on the third day, E(-3), before election day E(0). 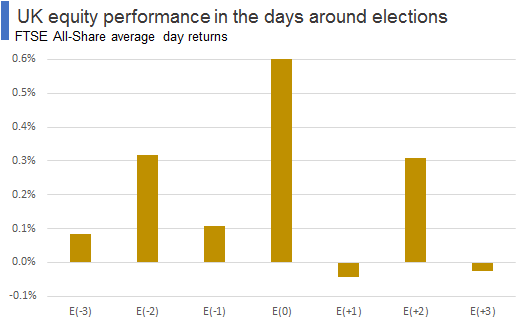 The following chart is similar to the above but plots the average day returns for the Index on each of the 7 days around elections. For example, in the 12 elections since 1970 the Index has had an average return of 0.1% on the day before, E(-1), the election. Further articles on the market and elections. How does the UK market trade in the days around US presidential elections? US presidential elections are held every fours years on the Tuesday following the first Monday in November (hence they are always between 2nd and 8th November). The newly elected president takes office at midday on Inauguration Day (20 January the following year). In 2016 the US presidential election will take place on 8 November. 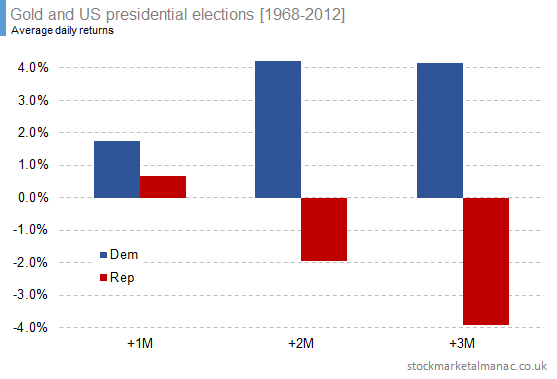 The table below shows the results of analysing the FT All-Share index for the 9 days around each US election since 1972. The average return for each day is shown in the chart below. As can be seen, the UK market tends to trade stronger in the four days before the election, and is weaker in the few days following the election. The strongest day of the period has been the election day itself. 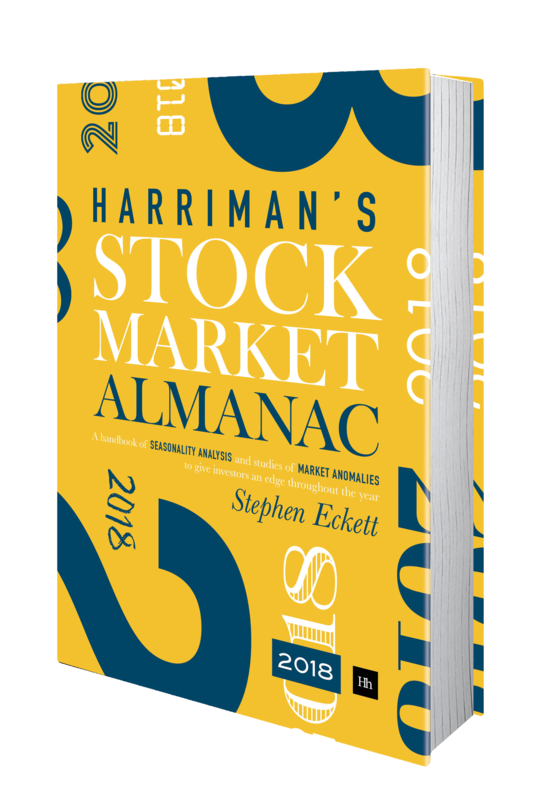 The above is an extract from the Harriman Stock Market Almanac. How has the price of gold reacted to US presidential elections? 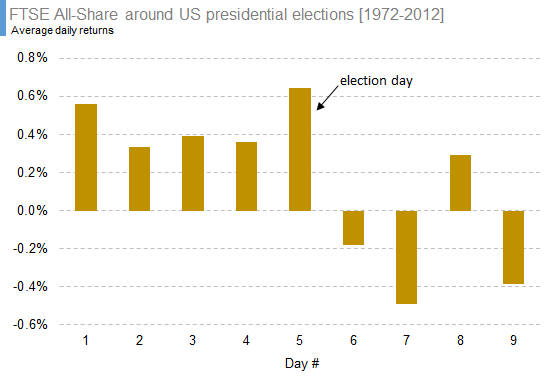 The following chart plots the average daily returns of gold for the nine days around the US presidential elections (1968-2012). So, the chart covers the period of the 4 days before the election and the 4 days after. For example, for the 12 US presidential elections from 1968 the price of gold has increased on average 0.2% on the day of the election itself (D0). As can be seen…well, in fact, nothing much can be seen as there’s no clearly discernible pattern of behaviour here. Let’s now see if there’s any significant difference in behaviour depending on whether a Democrat or Republican wins the election. 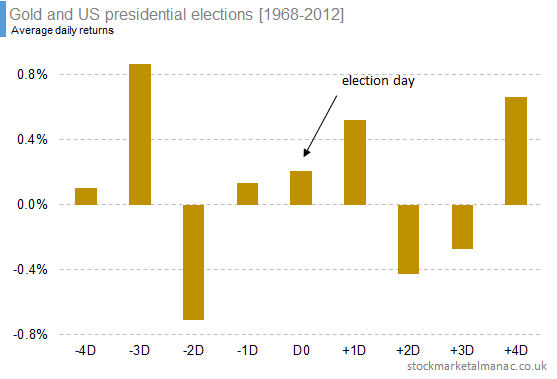 The following chart plots the average daily returns for gold for the election day and four following days. The averages are split as the average for the five times a Democrat has won compared to the seven times a Republican has won. For example, in the five elections that a Democrat has won the White House, the average daily return of gold the day following the election (+1D) has been 1.1%. Generally, the price of gold has been stronger following a Democrat win, and especially strong on the day following the election. 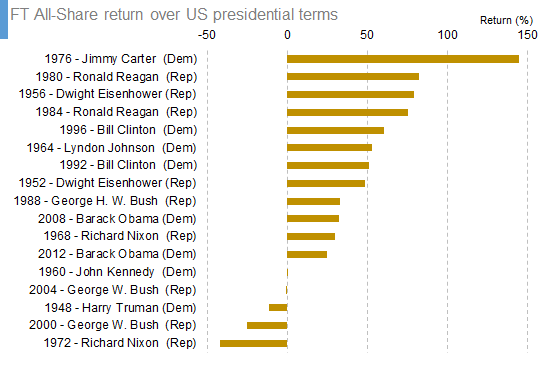 Let’s now zoom out time-wise and look at gold’s month returns around the elections. The following chart shows gold’s average month returns for the three months before, and three months after, US presidential elections. Historically, the gold price has been weak in the month leading up to the election (-1M) with an average month return of -1.8%. Following the election the price has tended to bounce back, with an average return in the following month of 1.1%. The following chart plots the proportion of months seeing positive returns in these six months around the election. For example, the price of gold has only risen four times in the month before an election in the 12 elections since 1968. This chart largely supports the the observation in the preceding chart which is that the price of gold is weak in the month preceding an election, and strong in the following month. Now to see if there is any difference in the behaviour depending on whether Democrat or Republican wins the White House. 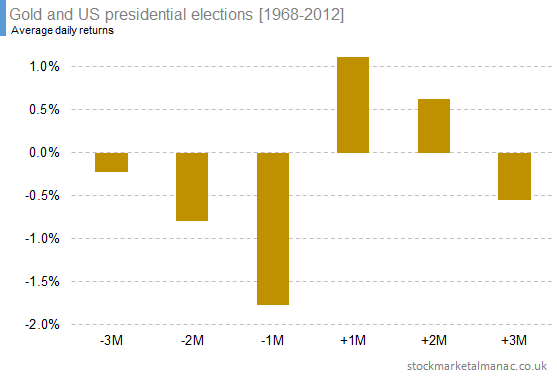 In the month following an election gold has risen on average 1.7% if a Democrat won, and 0.7% if a Republican won. The performance differential becomes more pronounced in the second and third month after the election – with gold seeing month returns of over 4% in the case of a Democrat win, and negative month returns in the case of a Republican win. Caveat: this analysis involves a very small sample size (there have been just 12 elections since 1968) so the results can not be regarded as statistically significant. But, given that caveat, it does seem that gold loves Democrats! 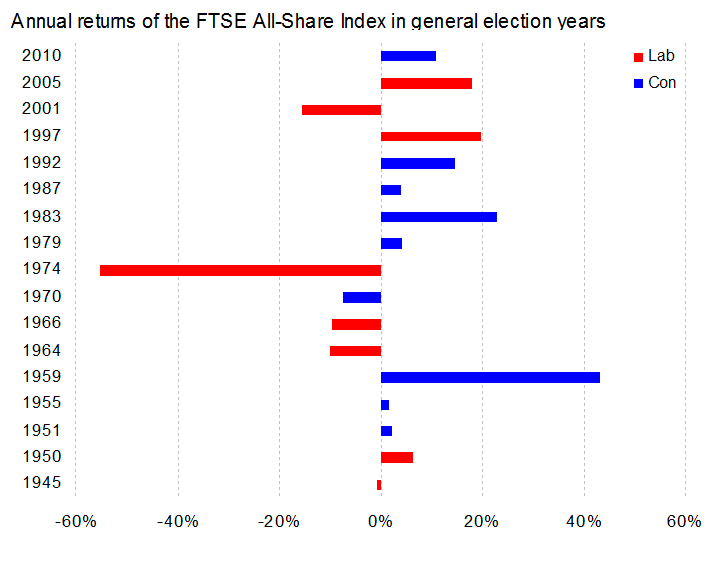 The 14 charts below show the performance of the FTSE All-Share index over the 12 months of a US presidential election year. For example, the first chart shows the January-December performance of the UK market in 1960, the year John Kennedy was elected President of the United States. The dashed line in each chart indicates the date of the election. Historically, the UK market tends to rise in the few weeks leading up to the election. 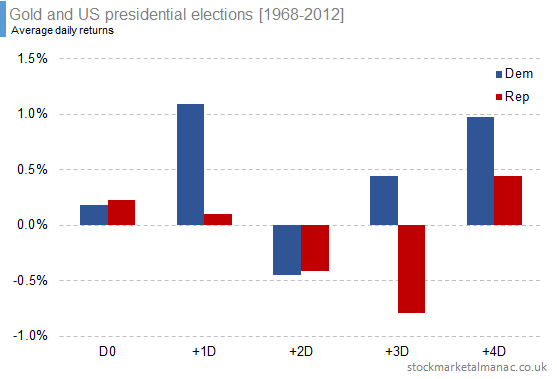 The following chart plots the annual returns of the FT All-Share Index in years of US presidential elections. In July 1945, two months after Germany surrendered, Winston Churchill was in Potsdam at the first meeting of the heads of government of the UK, US and Russia to decide Europe’s future. On the 25th of July Churchill flew back to London to await the results of the general election that had been held that month – the first election for ten years. With the war-hero Churchill at their head, the Conservatives were confident of victory, although some of the more pessimistic forecasters thought their majority might be as low as 30. The following afternoon the results started coming in and it was soon obvious that Labour had won by a landslide. The final result was a Labour majority of 146 seats – the first time Labour had won a majority. The following day the FT Industrials Index promptly fell 3 points to 115.
the most serious reverse since the dark days of 1940. Nationalisation was the bogey word spooking the market – the phrase “public ownership” had appeared many times in the Labour party manifesto. The genius of British scientists and technicians who have produced radio-location, jet propulsion, penicillin. and the Mulberry Harbours in wartime, must be given full rein in peacetime too. Well, perhaps not Mulberry Harbours but, yes, the future looked bright for British industry to exploit the new advances in electronics, radio and television, textiles, chemicals, plastics and pharmaceuticals. A few months later, by the time of Chancellor Dalton’s first budget, the FT Industrials Index had recovered nearly all the ground lost since the election. The FT described the budget as a “tonic for both industry and labour”, and when in December the government announced the nationalisation of 850 coal industry entities, the market shrugged and share prices rose. 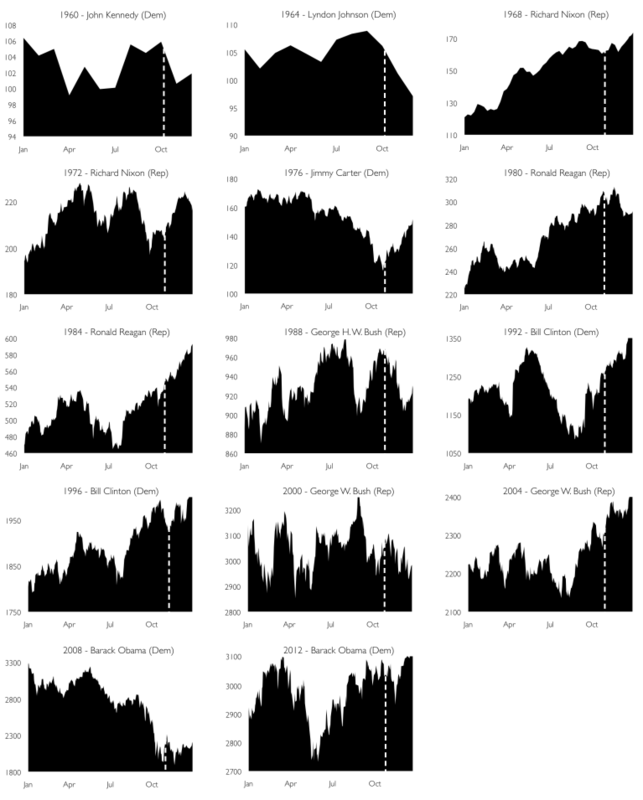 The 1945 election obviously took place at an exceptional time, but the reaction stages of the stock market are similar to those in other general election years. 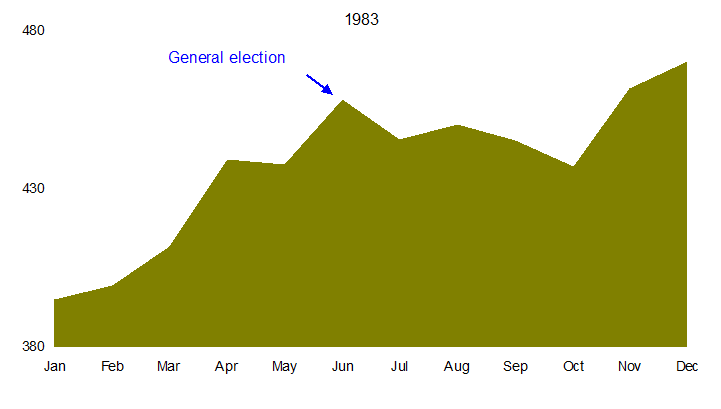 An example can be seen in the following chart of the market in the year 1983: the market rose before the election, sold off on the result, but ended the year higher. There have been 18 elections since WWII, and the market has ended the year higher than it started for 12 of those elections. 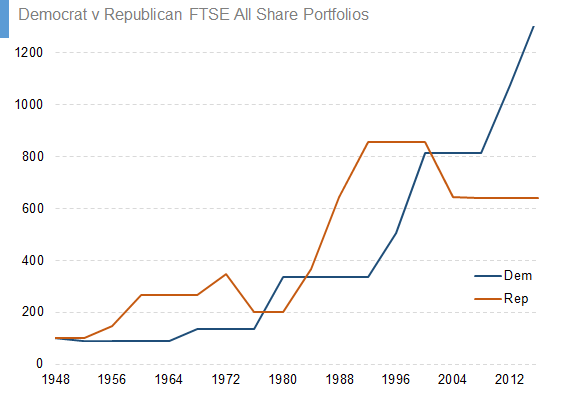 The following chart shows the annual return for the FTSE All-Share index in each election year since WWII. 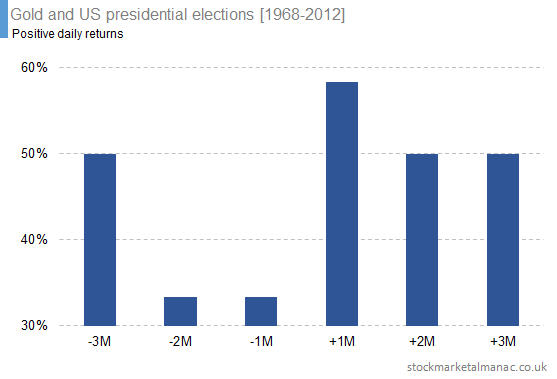 The average return in those 17 election years (in 1974 there were two elections) was 3.0%. Hence, historical precedent would suggest that the UK market will see a positive return in 2015. 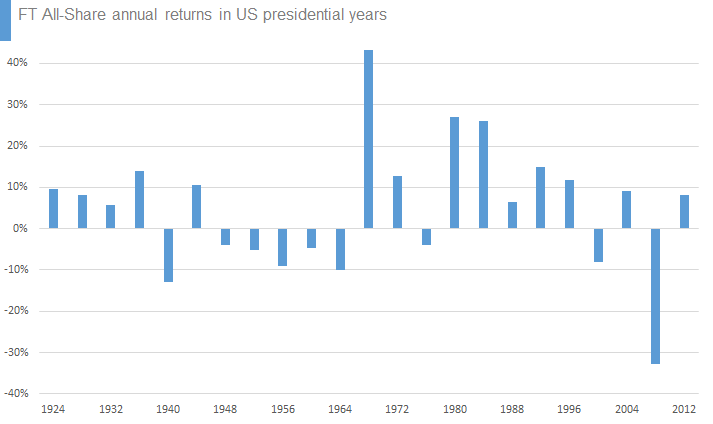 Another election to consider here might be the US presidential election in 2016: the last time the US market fell in a pre-presidential election year was in 1939, and the average return in these years has been 17%. Given the strong correlation between the US and UK markets, this could be another factor suggesting a positive return for 2015. The following chart shows the average performance of the stock market in the months around the election itself. On average the market has risen two months before an election, with an average return of 0.32%. But after that the returns in the following three months are all negative, with the second month after the election seeing an average return of -1.3%. In 2015 the general election will take place on 7 May, in which case history would suggest that the following two-month period up to 7 July will see a weak market. Of course, this period will overlap with the Sell in May effect which often sees a weaker market at this time of the year anyway. I always avoid prophesying beforehand, because it is much better policy to prophesy after the event has taken place. Article first appeared in Investment Advisor.